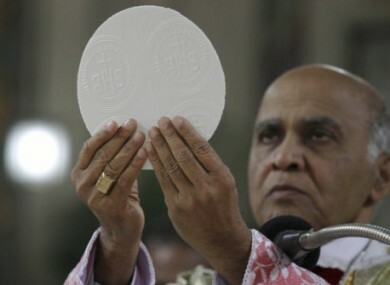 A priest in India celebrating Christmas mass in December 2010. THE PROGRAMME for the 50th International Eucharistic Congress, due to take place this June in Dublin, has been released. Around 25,000 people are expected to visit Dublin for each day of the Congress. The religious festival’s opening ceremony will be held on 10 June at the Royal Dublin Society in Ballsbridge, Dublin 4, where most of the IEC’s events will be held. The IEC’s ecumenical programme will begin the following day with special events involving the Church of Ireland Archbishop of Dublin the Most Rev Michael Jackson, Metropolitan Hilarion Alfeyev of the Russian Orthodox Church, and Brother Alois Löser, Prior of Taizé. The event’s organisers say that each day of the Congress has its own theme featuring cultural events and workshops which related to the overall theme of ‘The Eucharist: Communion with Christ and One Another”. Around 80,000 people are expected to attended the closing event – mass in Croke Park on 17 June. The Congress is held every four years and involves liturgical events, workshops and discussions about the Eucharist in the Catholic Church. The first and last time that Dublin hosted the event was in 1932, during which thousands of people attended the final mass of the Congress at Phoenix Park. The last Congress was held in Quebec in 2008. Tickets are available online in advance for the Congress and range from €95 for a seven-day pass to €30 for one day’s entry. Email “80,000 expected to attend closing Eucharistic Congress ceremony in Croke Park”. Feedback on “80,000 expected to attend closing Eucharistic Congress ceremony in Croke Park”.